Work on slaughter 2.x is going rather well. The scripting hasn't changed, and no primitives have been altered to break backward compatibility, but it is probably best to release this as "slaughter2" - because the way to specify the source from which to pull scripts has changed. The code has been made considerably neater, the test-cases are complete, and the POD/inline documentation is almost 100% complete. Adding additional revision-controlled transports would be trivial at this point - but I suspect I'd be wasting my time if I were to add CVS support! Life is good. Though I've still got a fair bit more documentation, prettification and updates to make before I'm ready to release it. Play along at home if you wish: via the repository. Tags: slaughter. | 8 comments. There have been a few interesting discussions going on in parallel about my slaughter sysadmin tool. These are instructions/perl code that are applied to the local host. Polices are allowed to download files. e.g. /etc/ssh/sshd_config templates, etc. I anticipate that the HTTP transport will continue to work the way it currently does. The other transports will clone/fetch the appropriate resource recursively to a local directory - say /var/cache/slaughter. So the complete archive of files/policies will be available locally. The HTTP transport will continue to work the same way with regard to file fetching, i.e. fetching them remotely on-demand. For all other transports the "remote" file being copied will be pulled from the local cache. The file "/global-keys" will refer to /var/cache/slaughter/global-keys which will have been already downloaded. I see zero downside to this approach; it allows HTTP stuff to continue to work as it did before, and it allows more flexibility. We can benefit from knowing that the remote policies are untampered with, for example, via the checking built into git/mercurial, and the speed gains of rsync. 1. Fetch the policy using the specified transport. 2. (Optionally) run some local command to verify the local policies. I'm not anticipating additional changes, but I'm open to persuasion. I've been using redis for a while now. It is a fast in-memory storage system which offers persistence (unlike memcached), as well as several primitive data-types such as lists & hashes. In other software-news I've had some interesting and useful feedback and made two new releases of my slaughter sysadmin tool - it now contains a wee test suite and more robustness. I received an email last night to say that my Raspberry PI has shipped. Ordered 24/05/2012, and dispatched 12/10/2012 - I'd almost forgotten about it. My plan is to make it a media-serving machine, SNES emulator, or similar. Not 100% decided yet. 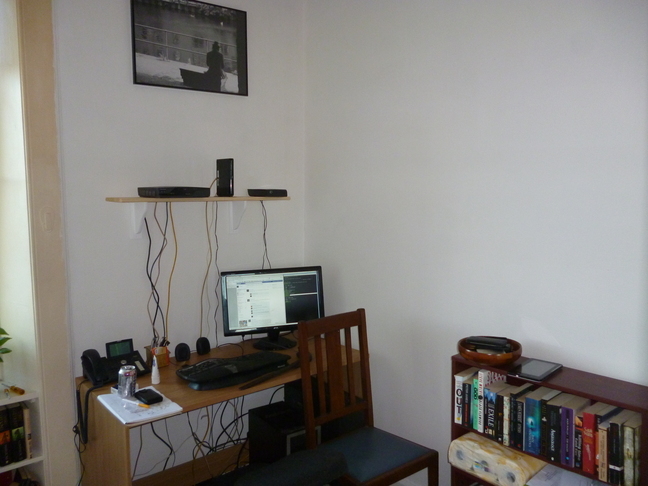 Finally I've taken the time to repaint my office. When I last wrote about working from home I didn't include pictures - I just described the process of using a "work computer" and a "personal computer". So this is what my office used to look like. As you can see there are two machines and a huge desk. 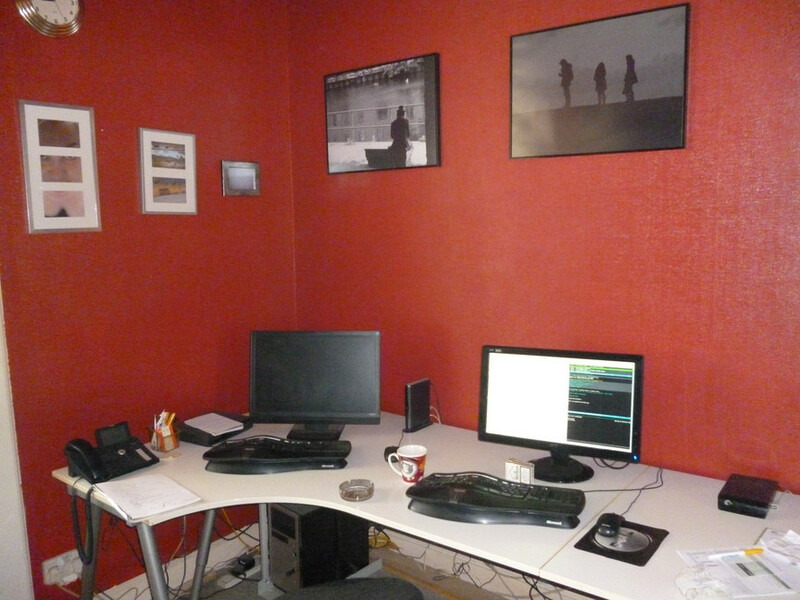 With a few changes I now have an office which looks like this - the two machines are glued-together with a KVM. and I have much more room behind it for another desk, more books, and similar toys. Additionally my dedication is now enforced - I simply cannot play with both computer as the same time. The chair was used to mount the picture - usually I sit on a kneeling chair, which is almost visible. What inspired the painting? Partly the need for more space, but mostly water damage. I had a leaking ceiling. (Local people will know all about my horrible leaking roof situation). Tags: pi, raspberry pi, redis, slaughter. | 3 comments. Did you know that number is not just the total number of people who clicked "Like" on your page? Did you know you can artificially inflate that number? Send a message to yourself with the URL in the body, such that it becomes an "attachment". Watch as the like-counter increases by 1 or even 2. Lather. Rinse. Repeat. Sending messages to other people probably does the same thing. But sending to yourself is sufficient. Tags: facebook, meh, random. | 1 comment.